It's indoor activities for me at present. I have yet another cold! The worlds worst patient, I am rather grumpy when not well. 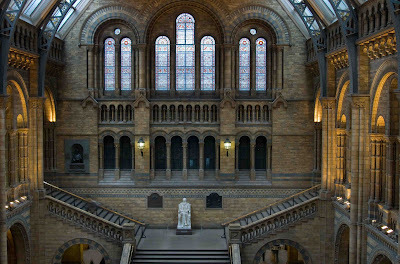 The Natural History Museum in South Kensington is a stunning building crammed with incredibly interesting exhibits. During school holidays the kids all make a beeline for the dinosaur exhibits. Sitting on the stairs looking towards the entrance is Darwin. A new state of the art scientific and collections centre named after him is to open next September. For photographers, the 2008 Wildlife Photographer of the year exhibition is on until April 2009. A must if you are able to go. I was there 2 weeks ago for the darwin exhibition and last weekend for the wildlife exhibition (really good pictures!). I always find this building si impressive, I like the outside as much as the inside. I have to go here the next time I visit London. I can't believe that on one trip I actually stayed about two blocks from here and never went. How silly of me. What a beautiful building. You have some wonderful glimpses of London. Glad for the cold weather so you can see so many things and share! The dinosaur exhibits, that brings back childhood memories! I liked the link too. I'm having trouble trying to photograph a robin! I think this is a long way off for me! Fantastic photo - great building! Great building for a wonderful collection! It's a really beautiful building. Looks very solid but graceful at the same time. Thanks for sharing.